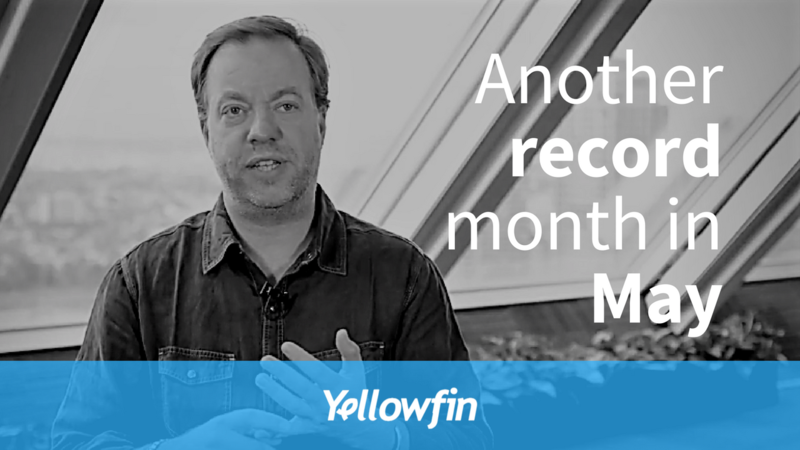 May at Yellowfin was fantastic for a range of different reasons, and I’m excited to share what we achieved. We had another awesome month from a sales perspective. On an underlying billings basis it was our biggest month ever (for the second month in a row). It’s a great outcome that has been driven by some exciting new deals. In Europe, we did a great deal with a company called Temenos who are a banking software platform. This deal really solidifies our foothold in the financial services industry. We have a very strong pipeline across banking and finance, so this is set to be an exciting sector for us over the coming year. Japan also made a big contribution thanks to an expansion of one of our key accounts. For this account, large parts of the organization have been leveraging Yellowfin for a couple of years. This expansion brings the rest of the enterprise onboard. It’s a particularly good deal because there’s no such thing as a small enterprise in Japan. At the same time, our US team has been smashing it with renewals. They’ve done a phenomenal job – achieving a renewal rate of almost 100%. Good work Team USA! Back in Australia we hosted a fantastic software vendor partner event during May. It was exciting to catch up with all of our partners in Melbourne and hear about what they’re achieving with the Yellowfin product. Lee Roquet, our Chief Customer Officer (again from the US). It was great to get everyone together to discuss strategy, what we’ve achieved and focus in on priorities over the second half of 2017. On a strategic front, it’s also exciting to announce that we’ve recently appointed Brad Scarf as our CTO. Brad’s done a fair bit of strategy work for us in the past and has already brought a lot to the table. I’m excited to have him on-board full-time. He’ll be leading our product team and looking at how to align product and organizational strategy to take us forward into the future. Over the past month I’ve particularly enjoyed seeing growth in the number of referrals we receive. More customers are referring new business to us, and more of our new hires are coming through employee referrals. We’re just about to appoint a senior salesperson from one of those employee referrals, not to mention a few dev hires. It’s a really nice outcome and a great compliment for the business as a whole. As we move towards the second half of 2017 we continue to pick up momentum. There’s a lot more exciting sales, hiring and product news coming over the next few months.